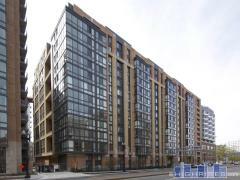 Since first opening in 2005, the condos at 400 Massachusetts Avenue NW continue to offer residents a fashionable home in the pulsing heart of downtown D.C.’s Penn Quarter neighborhood. At 13 stories high, the building is home to 256 condo units with all the modern amenities you’d expect: from hardwood floors and granite countertops to in-unit washer/dryer connections and highly coveted garage parking. One major draw: the building’s impressive outdoor spaces, where you’ll find residents on fair-weather days hosting barbecues, swimming laps in the rooftop pool, or just taking in desirable views of the Capitol Building with small-sized Fidos at their side. The definition of commuter-friendly living, you’ll be centrally located to all major Metro lines, as well have as near-instant access to I-395. Brain fuel (Chinatown Coffee Co.), fresh-made noodles (Chinatown Express), cultural exhibits (the National Building Museum), and more are steps away. Don’t even want to go that far? Just head downstairs and take advantage of your ground-floor tenants: a 24-hour CVS Pharmacy and the local watering hole, Sixth Engine. Have any comments or questions about 400 Mass? Ask your question and/or share your thoughts about this Building. Does building have any 3 bedroomapartments?Isit pet friendly?